Map of the Shihkang Dam and Beifeng Bridge. 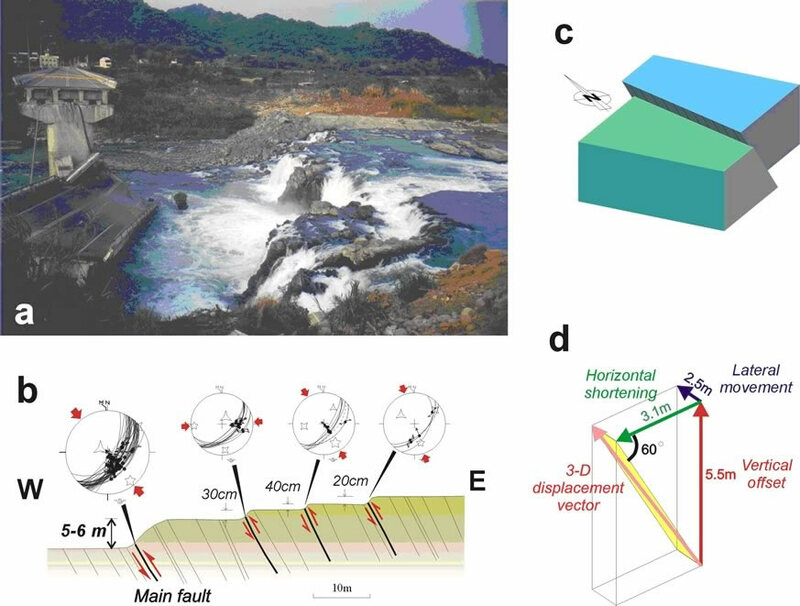 Complex deformation and fault system in the Shihkang Dam area (after Lee et al., 2002). See Fig. 9 for location. (a) Photograph of the Shihkang Dam showing the breaks of the dam body with a vertical offset of 8-10 meters. (b) A 3-D block-diagram of the deformation in the Shihkang Dam area. The Shihkang Dam is located on the pop-up fold lifted by thrust and backthrust. At least two thrusts situated on the northern end of the dam have broken the dam. The rest of the dam body has been folded and several different scales of pressure ridges can be observed along the foot of the dam. On the western side of the northern segment near the Pifeng Bridge (Fig. 3), the surface rupture extended across the active channel of the Tachia River and formed a spectacular waterfall of 5-6 m in height (Lee et al., 2002). At least three other 20-40 cm high minor thrusts were also located on the hanging wall of the main surface rupture (i.e., the waterfall, Fig. 13b). These faults cut 50°-60°-dipping strata of the Chinshui Shale parallel to the bedding or at a small angle of 10-20 degrees. Slickenside lineations on the fault planes were observed on the exposed ruptures in the fine-grained sandstone bedrock of the Chinshui Shale. The fault striations revealed dip-slip movements with minor lateral slip for both the main fault and the minor faults. Stress tensor inversions indicate NW-SE directed compression on a NE-SW trending reverse fault dipping to the southeast. The stress tensor is generally consistent with the focal mechanism of the main shock of the earthquake (Chung and Shin, 1999; Ma et al., 2000; Kao and Chen, 2000). Note that it is in good agreement with the focal solution of the northern sub-event of the main shock (Kao and Chen, 2000). 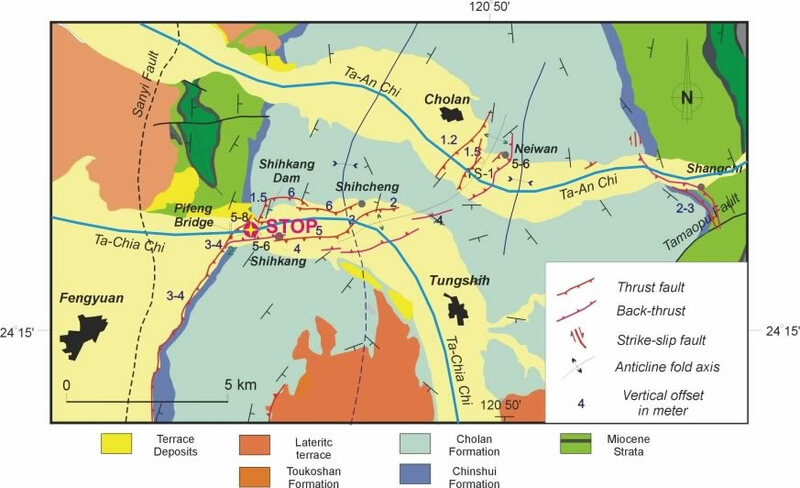 However, a 15-20 degrees clockwise change in the trend of the maximum principal compressive stress direction occurs between the earthquake focus located 50 km to the south and at the Pifeng Bridge site. Slip on the main thrust can be illustrated by a 3-D displacement vector with a vertical offset of 3.5 m, a horizontal shortening of 2.0 m, and a small amount of left-lateral strike-slip of 0.6 m. The main fault in the Pifeng area strikes N40°E and dips to the east at about 60°; the hanging wall block of the fault moved in the direction of N320°E. (Excerpt from the Post-Conference Field Trip Guidebook, “Field Guidebook to the Surface Ruptures of the 1999 Chi-Chi Earthquake” Joint Geosciences Assembly, 2001). (after Lee et al., 2002). (a) The Chichi rupture cut across the Tachia River bed and created a 5-6 m high waterfall while damaging the Pifeng Bridge during the Chichi earthquake. (b) Kinematics analysis and reconstruction of the movement of the fault in the Pifeng bridge area along the Tachi River, near Shihkang. A multi-fault system has been found on the riverbeds and clear striations have been observed on the fault planes and have been measured in order for the kinematics analysis. (c, d) 3-D reconstruction of the displacement vectors shows that the main fault can be represented by a west-vergent reverse fault (strikes N30°E, dips 60° to SE) with a minor left-lateral strike-slip component.